No matter where you live, fertilizing trees is an important task as it can help ensure their health. In drier climates, like Austin, however, fertilization becomes essential as a means of ensuring that your trees stay healthy, even during drought or other harsh weather conditions. 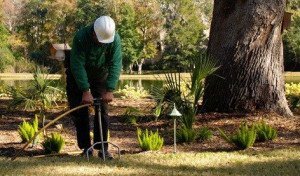 Ideally, you will want to fertilize trees on your property throughout the year and it is advisable to hire a professional. The advantage of having a tree professional doing it would be that they can pinpoint which exact nutrients are needed and select the ideal fertilizer based on this information. Young trees should be fertilized especially between March and early June as this is when they will do the majority of their growing in Austin. The biggest benefit of tree fertilization is that it ensures the trees on your property receive the necessary nutrients in order to grow. The dry, arid climate in Austin means that trees will find it more difficult to find nutrients naturally. The most important nutrients for trees to grow are nitrogen, phosphorus, potassium, calcium, magnesium, and sulfur. Adding these macro-nutrients, particularly nitrogen, can help improve the growth of the tree. As mentioned earlier, by having a arborist provide the fertilization for your trees, you will be able to pinpoint which nutrients are lacking and select the appropriate amount fertilizer. They can take a soil sample of your particular property and evaluate it or simply base their recommendations on knowledge of soil samples from the Austin area as a whole, as the nutrients found in the soil throughout the city should be fairly similar. Another benefit of fertilizing Austin trees is that it will make them stronger and this improves their ability to fight off pest attacks as well as recover after the attack is over, whether it was taken care of naturally or by an arborist. In fact, any tree that receives regular fertilization will be able to more quickly recover from any sort of injury, whether it is pests, disease, or even drought, a phenomenon that is fairly common in Austin. The ability of fertilization to strengthen a tree also means that it will reduce the negative effects that stress produce on it. These effects are particularly obvious in urban environments, such as Austin, as there may be air pollution, poor drainage, or other problems. Additionally, the tree may find itself competing for ingredients with grass and other plants in the yard. Fertilizing the tree, whether on the soil surface or deeper below the ground near the roots, can help make the tree stronger and reduce competition for nutrients and therefore stress. The most obvious benefit of fertilizing trees in Austin is that it will of course help to encourage growth, something which is particularly important for young trees. The fertilizer will specifically improve various factors that contribute to tree growth, such as water retention, soil air, microbial activity, and fertility.